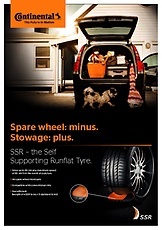 Don’t let a small puncture bring your journey to a halt. Continental brings innovative technology to all aspects of driving and vehicle maintenance. We know how important your time, safety and travel are to you. So what happens when you run over something with your car and puncture your tyre? Most people would have to pull to the side of the road, use a spare and drive to the nearest tyre repair service professional to replace the wheel or get it repaired. But by fitting your car with Continental tyres with ContiSeal™, your ride will be a little different. 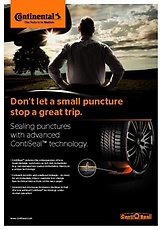 ContiSeal™ is a technology developed by Continental, designed to seal damaged tread. If you experience a puncture by a small yet impactful object like a nail, there is no need for an inconvenient and immediate roadside tyre change. With ContiSeal™ tyres, holes in the tread will remain sealed even if the object that caused the puncture becomes dislodged. ContiSeal™ is a sticky, gum-like sealant layer inside the wheel, in the tread area. The technology seals 80% of all punctures, reducing the risk of flat tyres. ContiSeal™ tyres are clearly marked with a symbol on the sidewall and are compatible with all commonly-available wheel rims. For optimal conditions, at Continental we recommend using a Tyre Pressure Monitoring System (TPMS) in conjunction with ContiSeal™. It is not necessary to stop immediately for a tyre change. Your journey can continue. When you discover a puncture, we recommend that a tyre specialist promptly checks the wheel. A ContiSeal™ tyre has a sticky, gum-like sealant layer that is inside the tyre in the tread area. It provides an almost instantaneous seal around any penetrating object (up to 5mm diameter in the tread area) in order to trap the air inside, keep the tyre inflated and you mobile, without an inconvenient roadside tyre change. When a puncture occurs on a standard tyre, the sidewall can get crushed between the rim and the ground, leading to a potentially dangerous situation, such as a blowout or the tyre slipping off the rim, which can make it impossible to fit a spare tyre.